Help You Edit Videos on Windows 10/8.1/8/7/Vista/XP PC without Video Editing Experience at Ease. 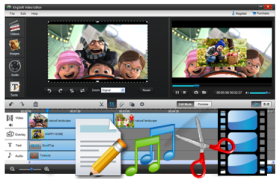 UFUSoft Video Editor is an easy home video editing software that consists of Video Clipper, Video Cropper, Video Merger which allows you to clip, crop and merge your video files on Windows 10/8.1/8/7/Vista/XP PC. Besides, it is also good at editing video in a large variety of video formats including 4K UHD, SD, HD, any camcorder/camera video and other video files like HEVC/X265, XAVC, XAVCS, MXF, MKV, AVI, MOV, MP4, WMV, FLV, MTS, M2TS, DAV, Webm, VOB, NSV, PVR, TP, TRP, TS, etc for playback on various devices. 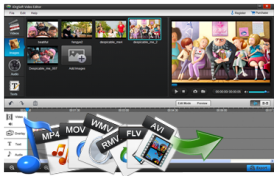 What’s more, it allows to choose to convert edited videos to HD/SD video formats for playing with iPhone, iPad, Android, Nokia Lumia, HDTV, etc, further editing with Movie Maker, Sony Vegas, Premiere Pro, Avid, etc or uploading to Youtbue, Vimeo, Myspace, Facebook, etc. * This video editor works well with nearly all video formats like MKV, AVI, WMV,MPG/MPEG, MP4, MOV, FLV, M4V, DV, 3G2, Xvid, Divx, RM/RMVB, etc. * This Video Editor Supports all camcorders videos like MXF, MTS, M2TS, MOV, MP4, MOD, TOD, AVI, etc from Panasonic, Sony, Canon, JVC, Nikon, Kodak, Flip, DJI, etc. * As a Video Clipper, UFUSoft Video Editor allows you to clip video files, split video files to whatever length you want within the timeline. * Also combines with Video Converter, you can choose to convert imported videos to HD MP4, HD AVI, MPG, WMV, MOV, etc for playing, further editing or sharing. * UFUSoft Video Editor works perfectly on Windows 10, Windows 8.1, Windows 8, Windows 7, Windows Vista, Windows XP, etc. Why Choose UFUSoft Video Editor for Windows 10/8.1/8/7/Vista/XP? 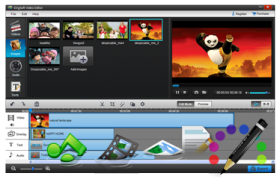 UFUSoft Video Editor for Windows offers an easy way to make home movies impressive and personalized. You can easily turn your video clips to movies with several simple clicks. Perfectly timed movie can be made on the timeline. You just need to drag and drop the original video files to the timeline, and join them with smooth transitions, meanwhile you can add image, music, video, text to your movies. 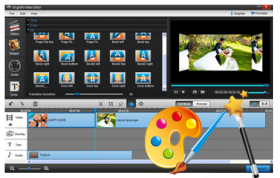 This Video Editor enables to edit videos in all formats like MP4, MOV, FLV, MKV, AVI, WMV, MXF, MTS, M2TS, HEVC/X265, MPG/MPEG, RM/RMVB, SWF, 3GP, M4V, DV, 3G2, Xvid, Divx, etc. and audio files in AAC, APE, AIF, MP3, OGG, WMA, FLAC,etc. Timeline is a tool to make editing more accurate, or rather you can edit your videos accurately up to seconds. On it, you can cut, add image, add video, audio, text, transition to certain time point on the video. It can convert videos to different audio formats like MP3, AAC, AC3, etc to put to iPhone,iPad, iPod, Samsung Galaxy S8, etc. It can adjust video brightness, contrast, saturation, resolution, frame rate, bit rate codec, etc. to make the videos personalized. Automatically check for updates and download the latest version of the Video Editor for Windows. This Video Editor is embedded with an image-capturing app that allows you to capture interesting images from the videos. It allows to import and convert a bunch of files at one go, and output them as a whole movie with all items you add to the videos. Any problem or questions about the Video Editor for Windows, feel free to contact UFUSoft Studio via support@ufusoft.com, a reply will go. Editing Software Sony Vegas, Windows Movie Maker, Windows Live Movie Maker, Adobe Premiere Pro, Adobe Premiere Express, Adobe Premiere Elements, After Effects, Magix Movie Editor Pro, Corel Video Studio ProX 3, Pinnacle Studio, Avid, Avid Media Composer, CyberLink PowerDirector, Imgburn, Nero, Roxio Toast Titanium and etc. * Memory: 512 MB physical RAM (memory) or above. * Processor: 1GHz Intel®, AMD® processor or above. * Graphic Card: 1024*768 or higher resolution display. « How to Play 4K Blu-ray or 4K Video on iMac/Macbook, macOS Sierra?